Wholesale Roasted Peanuts Salted And Sold In 30 Pound Containers. 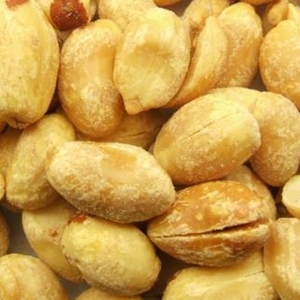 Our wholesale roasted peanuts salted are perfectly roasted for a fresh crunchy taste that will not disappoint. You can use salted peanuts in both savory and sweet recipes and are commonly flavored with honey. Peanuts are a small annual herb growing up to a foot above the ground. It is thought to have originated in the Central Americas and from where it spread to rest of the world through Spanish explorers. Today, they are one of the widely cultivated oil seeds and has established as prime commercial crop in China, India, African nations, and the United States of America.Peanut plants take approximately 120 to 150 days to produce the crop. To harvest, the entire plant, including roots, is dug out of the soil. Each plant may bear 10-150 fruit pods. The pods have rough, wrinkled outer shells with 2-3 constrictions as in bean pods. The raw blanched peanut is not a nut, but a legume related to beans and lentils. Each peanut kernel is covered with thin brown layer and can be split into two equal halves as in any other legumes. Health benefits of our wholesale roasted peanuts salted: Peanuts are rich in energy and contain health benefiting nutrients, minerals, antioxidants and vitamins that are essential for optimum health. They compose sufficient levels of fatty acids that helps lower LDL or "bad cholesterol" and increase HDL or "good cholesterol level in the blood. The kernels are a good source of dietary protein; compose fine quality amino acids that are essential for growth and development. Recent research studies suggest that roasting/boiling enhances antioxidant bio-availability in the peanuts. It has been found that boiled peanuts have two and four-fold increase in antioxidants content. The nuts are rich source of minerals like copper, manganese, potassium, calcium, iron, magnesium, zinc, and selenium. INGREDIENTS: PEANUTS, SUNFLOWER OIL, PEANUT OIL, SALT.